For Sale: Ivory's Crystal Slipper -- very athletic gold filly. Ivory's Crystal Slipper is a palomino 2012 filly. She will mature to approximately 16.0 hands tall. She by High Point's Ivory Coast and out of Stonewall's April Ice.. Her bloodlines include: Desert Supreme Memories, Courageous Admiral, Stonewall King, Stonewall's Gold Rush, Bobby Sea, Hide-A-Way's Firefly Supreme, Baron De Bastrop, and More To Go. Crystal has an athletic built with a good conformation and great movement. She has a great neck/shoulder tie for chest piece head set, pretty head, uses her ears, wide chest, and powerful hindquarters. This filly is built to be athletic and competitive in various competitions. Crystal has a great disposition and is very willing to learn. She is very friendly. 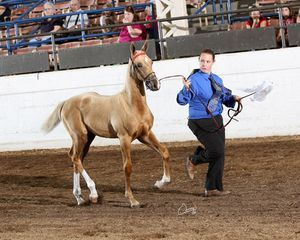 She is a in the pocket type saddlebred. She would be great for amateur-owner-trainer or experienced youth. Photo by Osteen Photography. See more photos in the photo gallery. Crystal is broke to lead, tie, load/unload in a trailer, clip, bathe, and stand for the farrier. She is very easy to catch. She likes people. 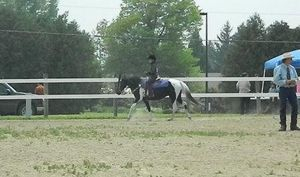 Crystal does trot, walk, and park out on a line. She has been shown in halter at local and futurities. She was ribbon winner and in the money. Crystal is eligible for the ASHB IL Futurity, ASH IA Futurity, Lamoine Trail Saddle Club Futurity, and QCABHA Futurity. $1,000 or best offer. For Sale: IHF Black Pearl ----SOLD!!! The above 3 pictures are from the Galesburg Boots and Saddle Club 2013 May Open Horse Show. Pearl placed in every class she was in. 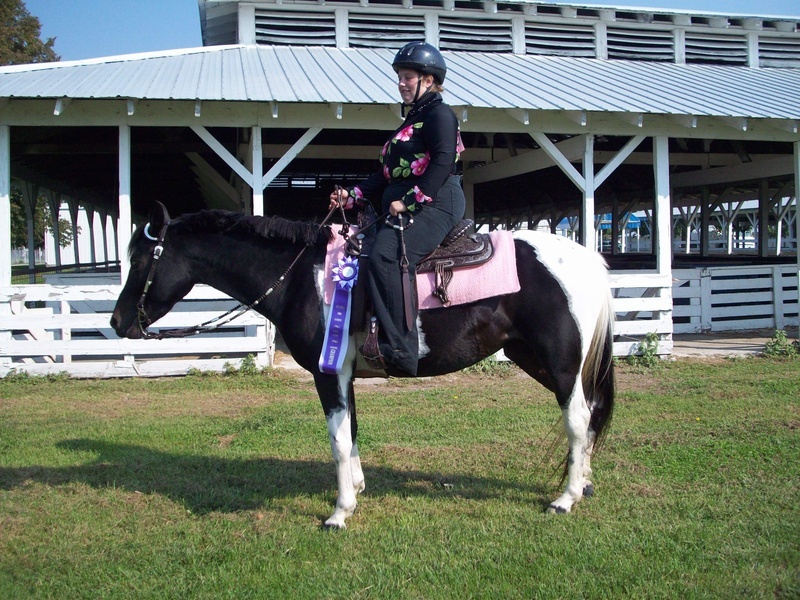 She competed in showmanship, pleasure, walk/trot, pattern riding, and fun classes. Pearl won the Pattern Riding (western riding) class. It was her first time performing the pattern as well as her first time competing in the class. She did flying lead changes. Pearl was shown by 10 year old and 14 year old girl. Are you wanting a competitive pony for show ring? Here she is. 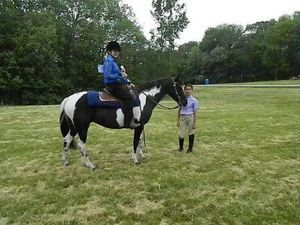 IHF Black Pearl is a 2003 black/white tobiano paint pony. She is stands 55" or 13.3 hands tall. She is broke to ride Western or English. 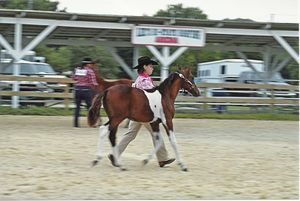 She has been shown successfully in halter, showmanship, western pleasure, horsemanship/equitation, and English Pleasure. Pearl was off the summer of 2011 to have her first foal. She was a great mother. She had a colt, Unexpected Luck (see below), who is bay/white tobiano, by Luck of the Irish. See Photos of 2012 and Futurity of IHF Black Pearl in the Photo Gallery. 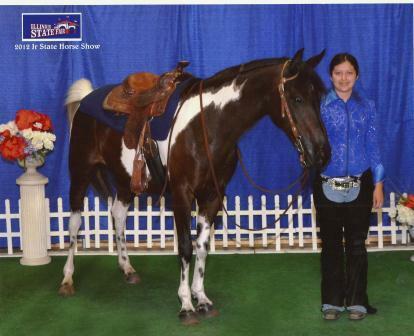 In 2012 Pearl went back to the show ring with Emma. They successfully competed in local, 4-H, and IL State Jr. Horse Show. This team was in the ribbons at every show in 2012. They competed in halter, hunt seat pleasure, hunt seat equitation, western pleasure, western horsemanship, and reining. Pearl has great sliding stops, beautiful loping circles, rollbacks, and nails flying lead change every time. She can lope all day. 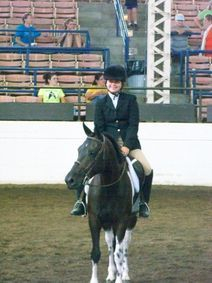 She has been also worked on pattern riding (western riding pattern) as well as intro level dressage patterns. Pearl was the QCABHA 2008 Mature Pleasure Champion and 2004 QCABHA Reserve Champion in Lounge Line. She placed 8th in western horsemanship at the IL State Jr. Horse Show. Pearl is great on trail rides -- walks nicely on trails and through water crossings. She can be ridden by an adult or youth. 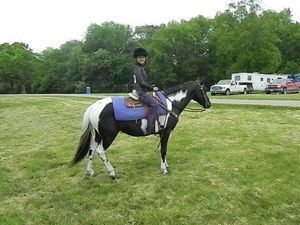 Here is an opportunity to own a real show pony who is blast to ride. $1650 or best offer. Luck of the Irish -- SOLD!!!! Lucky is broke to ride. He has been shown in halter, walk/trot, western pleasure, and English pleasure. 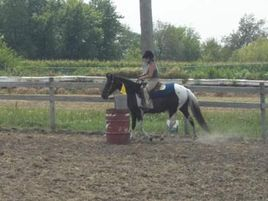 He was used for advance beginner, intermediate, and advance rider lessons last summer. He was a money earner in futurities when he was younger. 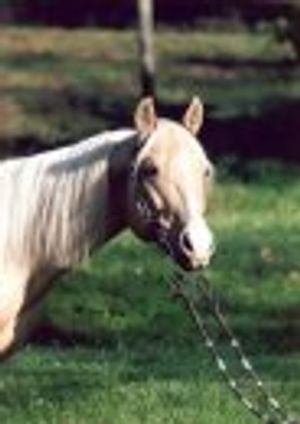 Lucky was the 2002 QCABHA Weanling Futurity Pony Champion. He has great dispositon and friendly. He naturally has a western pleasure head set and movement. He would also excel in hunt seat pleasure. 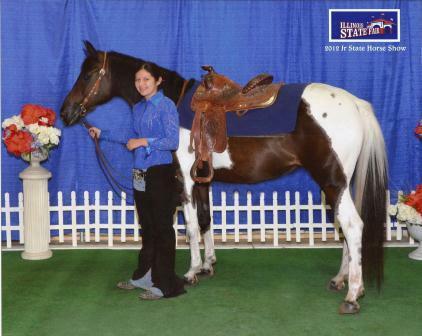 Here is an opportunity to own a competitve gelding for the show ring. $500 or best offer. See also picture to side, below, and in photo gallery. 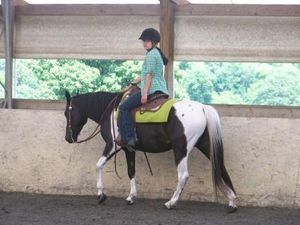 Unexpected Luck is a 2010 bay/white tobiano gelding. He is by Luck of the Irish (his last foal) and out of IHF Black Pearl (see above). He should mature approximately 13.2-14.0 hands tall. Unexpected Luck has been shown in halter. He has placed each time and been in the money See more photos in photo gallery. He is broke to lead, tie, load/unload in trailer, clip, and stands for vet and farrier. He does have nice pivots on the lead and trots nicely. In 2013 he will be broke to ride starting in March. Asking $500. His price will go up with training.